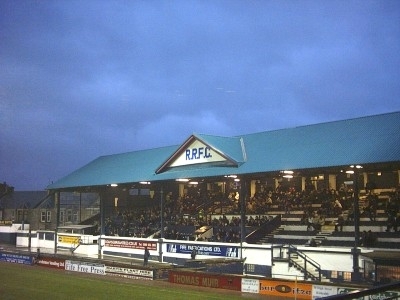 Raith Rovers were founded in 1883 and play in the town of Kirkcaldy. Though there were a few other team who incorporated the town name, such as Kirkcaldy Wanderers, Raith were the most successful of the local teams. A mixture of local success and ambition took the club into the Senior leagues where they established themselves and thereby became the pre-eminent team in the town. As a curiosity the town also plays host to the oldest British ice hockey team but they too eschew the town’s name, instead taking the county name to be called Fife Flyers. Perhaps the tricky pronunciation of Kirkcaldy is to blame! The town itself is located on the south coast in the County (or Kingdom) of Fife in the east of Scotland, just north of Edinburgh over the Firth of Forth. It has a population of around 50,000 and is therefore the largest town in Fife and around the 12th largest in Scotland. The old Kirkcaldy District which includes the surrounding towns and villages has a population of around 148,000 people. There are three other senior league teams in Fife with East Fife around eight miles to the east, and Cowdenbeath and Dunfermline nine and fourteen miles respectively, to the west. Kirkcaldy has historically been an industrial town with linoleum and coal mining the main employers. However times have changed and following the closure of most of the local coal mines in the 1980’s the town has diversified and modernised its employment opportunities – a process that is still ongoing and hasn’t been entirely painless. 1883 – Club founded and start playing at Robbie’s Park in Kirkcaldy. 1890’s – Club move to Stark’s Park when Robbie’s Park is used to create a new public park named after Provost Michael Beveridge. 1902/03 – Elected to the Scottish League. 1907 – The club incorporated into a limited company and the Raith Rovers Football and Athletic Company, Ltd was born. 1909/10 – Elected to join 1st Division after two consecutive successful seasons in 2nd Division. 1912/13 – Only appearance to date in the Scottish Cup Final losing 2-0 to Falkirk. 1921/22 – The club has its highest ever league finish when they come third to the Old Firm. 1923 – Shipwrecked (!!) on way to play friendly matches on the Canary Islands when their boat runs aground. All players safely disembark and continue on their way a few days later. 1937/38 – Become British League Record Goalscorers with 142 goals in just 34 league matches while winning the 2nd Division championship, a record which still stands today. The forward line of Glen (5 goals), Gilmour (35), Haywood (47), Whitelaw (26) and Joyner (21) scored 134 of the record 142 goals. 1938 – A record crowd of 25,500 fills Stark’s Park on a Wednesday afternoon (!) for a Scottish Cup quarter-final replay against East Fife. East Fife win 3-2 and go on to become the only 2nd Division club to win the Scottish Cup. The first game had attracted 19,000 to Bayview! 1948/49 – Reach the League Cup final for the first time although lose 2-0 to Rangers. In an echo of what will happen four decades later the club go on to win the 2nd Division title. 1951 – Lose 3-2 to Celtic in a Scottish Cup semi-final at Hampden watched by a crowd of 84,640 – the largest gate for a Raith match. 1967/68 – Striker Gordon Wallace becomes the first player outwith the Old Firm to be voted Player of the Year. He scored 27 goals in 34 matches. 1992/93 – Rovers surprisingly run away with the 1st Division title to start the most successful period in the club’s history. Dalziel (33) and Brewster (22) rack up 55 goals to become the most successful strike pairing in Rovers modern era. 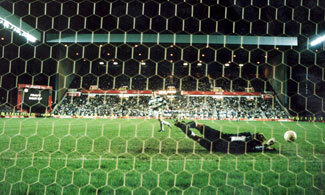 1994/95 – Win the League Cup (Coca-Cola Cup) by beating Celtic 6-5 on penalties after a 2-2 draw at Ibrox. Go on to win the 1st Division title again despite being well off the pace at Christmas due to the exertions in the League Cup. Unthinkable surely for the skipper to miss… but he has! 1995 – Play first competitive matches in Europe. After putting out both the Faroese and Icelandic champions in the first two rounds the club finally succumb to eventual UEFA Cup winners Bayern Munich although not before leading 1-0 at half time in the Olympiastadion. One nil to the Rovers! 2005 – The Reclaim The Rovers campaign was launched, and eventually achieved its objective on December 30th of a successful takeover of the football club. The six-figure investment made by the five supporters organisations involved in the campaign secured a place on the board of Raith Rovers for a representative of these groups, who are now established as the Raith Forum. There’s also a nice graphical history of Raith strips through the years here and a detailed Wikipedia entry for the club here. Raith Rovers are very fortunate to have a very active Former Players Association, with heroes from the near and distant past in attendance at every home match. As Honorary President of the association, Andy Young was one of the greatest ever Rovers players, having played 611 first team games and scoring 141 goals between 1945 and 1960. In the last few years of his life Andy took to the pitch almost as many times as that to pick the winning ticket in the half-time draw! Alex James – Played from 1922 to 1925 before heading to Preston then Arsenal. Became one of the outstanding players of his generation winning countless trophies and captaining Arsenal. Dave Morris – Rovers most capped Scottish player – 6 caps in the mid 20’s. Bert Herdman – Legendary Manager from 1945 to 1961 containing some of the clubs most successful seasons and a sustained period in the top flight. Willie Penman – Rovers top scorer with 151 league and cup goals, 50 more during WWII and 10 others in friendlies. Andy Young – Made 611 appearances from 1945 until 1960. Andy Leigh – 487 appearances from 1948 to 1963 before running the club’s Development Association and then becoming groundsman until 1994. Willie McNaught – 657 appearances between 1941 and 1961 – still a record for any Rovers player. Capped 5 times for Scotland. Johnny Urquhart – Served as a player, director and president over five decades from 1950’s. Jim Baxter – Signed in 1958 and become one of the legendary Scottish players of the post-war era. Donald Urquhart – 1971 to 1985 – 497 appearances. Gordon Dalziel – Record league goalscorer with 154 goals for the club during the 80’s and 90’s. Also spent two years as manager of the club from 2004 to 2006. Frank Connor – Manager from 1986 to 1990 – took the club from depths of the 2nd Division to a solid 1st Division spot. Jimmy Nicholl – Manager and player (until ’94) from 1990 to 1995 which contained two 1st Division titles, the historic League Cup victory and Rovers first and only (so far!) foray into European competition. Football grounds throughout the UK have changed almost beyond recognition over the last twenty years and Starks Park has been no different. But from ash terracing to cantilever stands, Rovers fans have been watching their favourites perform at the same venue for over 100 years. Raith moved to Starks Park on the west edge of the town late in the 19th century when their original pitch, Robbie’s Park, was chosen to become a new local park with money bequeathed by Provost Michael Beveridge. The ground itself has undergone substantial changes over the years. Initially there was a simple pavilion with cinder banks for spectators. In 1922 the Main Stand was built and remains in use to this day. The money borrowed to build the grandstand was only finally paid off in 1948 when a player was transferred!! Much less ambitious redevelopment happened in the 1950’s with both ends of the ground receiving covered standing enclosures. Floodlights were installed in 1960. These all survived until the major ground reconstruction that accompanied the club’s most successful period in the 1990’s. Two identical all-seated covered stands were built at either end, while the smaller Railway-side stand, which had been built in the early 80’s, was extended the full length of the pitch. 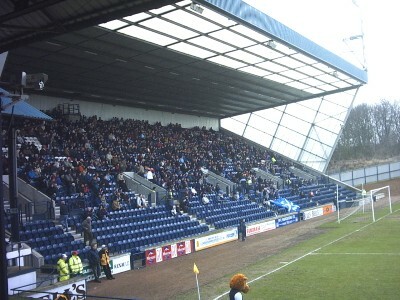 Today the Railway Stand is no longer in use as is the case with the terracing on the opposite side. Therefore apart from the Main Stand which runs only a third of the way along the side of the pitch, the vast majority of fans see the game from behind the goals.